This is an encyclopedia article. 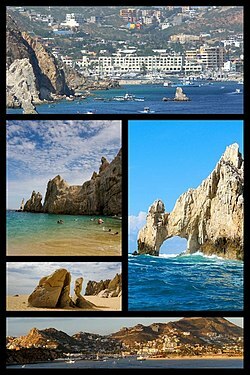 For a travel guide see Cabo San Lucas on Wikivoyage. Cabo San Lucas (Spanish pronunciation: [ˈkaβo san ˈlukas], "Saint Luke Cape"), or simply Cabo, is a resort city at the southern tip of the Baja California Peninsula, in the Mexican state of Baja California Sur. As of 2015, the population of the city was 81,111 inhabitants. Cabo San Lucas together with San José del Cabo is known as Los Cabos. Together they form a metropolitan area of 305,983 inhabitants. Cabo has been rated as one of Mexico's top 5 tourist destinations; it is known for its beaches, scuba diving locations, balnearios, the sea arch El Arco de Cabo San Lucas, and marine life. The Los Cabos Corridor has become a heavily trafficked vacation destination for tourists, with numerous resorts and timeshares along the coast between Cabo San Lucas and San José del Cabo. Archaeological excavations have shown evidence of continual human habitation in the area for at least 10,000 years. When the first Europeans arrived, they encountered the Pericú people, who survived on a subsistence diet based on hunting and gathering seeds, roots, shellfish, and other marine resources. They called the location Yenecamú. According to the narrative of Hatsutaro, a Japanese castaway, in the book Kaigai Ibun (written by Maekawa, Junzo and Bunzo Sakai and narrated by Hatsutaro), when he arrived at Cabo San Lucas in May 1842, there were only two houses and about 20 inhabitants. However, American authors such as Henry Edwards and John Ross Browne claim that Cabo San Lucas's founder was an Englishman named Thomas "Old Tom" Ritchie. John Ross Browne says Ritchie arrived there about 1828, while Edwards says that he died in October 1874. The actual founder of Cabo San Lucas was Cipriano Ceseña in 1788 who arrived from Hermosillo, Sonora. Per The book by Pablo L. Martinez, Guia Familiar de Baja California 1700-1900. A fishing village began growing in the area. In 1917, an American company built a floating platform to catch tuna, and ten years later founded Compañía de Productos Marinos S.A. The plant operated for several years. Cabo San Lucas has become a prominent vacation and spa destination, with a variety of sites of interest and timeshares that have been built on the coast between San Lucas and San José del Cabo. The distinctive Arco de Cabo San Lucas is a local landmark. Cabo San Lucas has the highest paying marlin tournament in the world called the "Bisbee's Los Cabos Offshore". This tournament takes place every year in the month of October. In the winter, pods of whales can be observed in the area. They bear their calves in the warm waters of the Gulf of California after completing their 6000-mile migration from Alaska and Siberia. The beaches, surfing, and sport fishing opportunities in Cabo San Lucas have attracted a great number of Mexican natives and foreigners to spend their vacations in large-scale tourist developments there. The development of Cabo's tourism industry was prompted by the Mexican government's development of infrastructure to turn Cabo San Lucas into a major center for tourism in Mexico, beginning in 1974. Upon completion of the Transpeninsular Highway, also known as the Mexican Federal Highway 1, tourist developments in Los Cabos proceeded relatively unchecked. Until fairly recently,[when?] the unique and fragile environment of this part of Mexico was largely unprotected by law, and therefore was subjected to developers acting in concert with government agencies interested only in low-end tourist bonanzas. There is, however, a growing collection of activists and attorneys now involved in preserving many of Baja's desert habitats, marine mammals, and stretches of coastline. A number of agencies including the Gulf of California Conservation Fund and the Center for Environmental Law in La Paz are challenging the destruction of wetlands and other ecosystems from Los Cabos to Ensenada. In the face of a growing international public demand for corporate-driven ecological stewardship, higher-end resorts in the Los Cabos area are increasingly sensitive to their environmental impact, and are taking initial steps to institute sustainable practices such as reducing water usage and non-recyclable trash output. In 2017 Los Cabos is projected to be one of the leaders in travel in Latin America, many of the developments owed to its increased accessibility with added plane routes from the US and Canada. It is expected that by 2018 4,000 new sleeping rooms will come online in Cabo, and the increase in tourism will contribute to its growth as a leader in leisure. Cabo San Lucas and San José del Cabo are served by Los Cabos International Airport. The town is also a popular port of call for many cruise ships. Cabo San Lucas has a small international airfield, which handles air traffic for general aviation flights and air taxi service. Many tourists get around the area through the numerous local taxis that service the primary parts of Cabo, as well as the Corridor and the airport. Alternatively, there is a system of small buses that are used by locals but also available to tourists, and costing a few pesos tend to be much less expensive than the taxis. Clubs in Cabo include the Cabo Wabo Cantina, a nightclub owned by rock star Sammy Hagar, founded originally by himself and other members of Van Halen, named after their hit single Cabo Wabo. There is also the Baja Brewing Company (also the first microbrewery in Baja California), Pink Kitty Nightclub, Mandala, El Squid Roe, Giggling Marlin, Nowhere Bar, Tiki Bar, the Usual Suspects and the Jungle Bar. Restaurants in downtown Cabo include Edith's, Hacienda Cocina y Cantina, and Sunset da Mona Lisa. Tourists can also ride horses through the desert, charter a boat for fishing, snorkel, and parasail on the beach. The English-language newspaper for Cabo San Lucas, the biweekly "Gringo Gazette", has news on tourist activities in Cabo San Lucas, San Jose, Todos Santos, La Paz, and the East Cape Baja. The corridor is home to a variety of hotels and tourist attractions. High-end resorts in the corridor include The Resort at Pedregal, Las Ventanas al Paraiso, and Esperanza. Medano Beach, located in the Chileno Bay, is one of the most frequented beaches in the Corridor. It is home to tropical fish, sea turtles, invertebrates, and sponges. Snorkelers often visit Chileno Bay to observe the underwater sea life. The extreme south of Baja California has a tropical desert climate (Köppen: BWh). Even with the thermal amplitude there are no freezes. During summer, Cabo San Lucas is cooler than San José del Cabo by about 1.5 to 3 °C (3 to 5 °F). Sometimes during the summer, when winds blow from the Pacific Ocean instead of the Gulf of California, the differences in temperatures between San José del Cabo and Cabo San Lucas are higher. Cabo San Lucas is less rainy than San José del Cabo, although hurricanes can bring heavy rain for long periods. 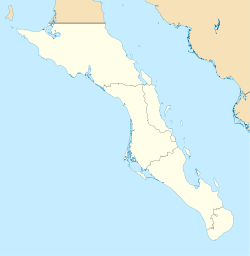 Hurricane Odile made landfall at Cabo San Lucas on 14 September 2014, and caused widespread damage. Due to the position of the city and orography, local summer thunderstorms do not get near enough to bring rain to the town. The sea temperature experiences lows of 21–22 °C (70–72 °F) in winter, and highs of 28–29 °C (82–84 °F) during the summer months. As of the 2015, the population was 81,111 and has experienced very rapid growth and development. It is the third-largest city in Baja California Sur after La Paz and San José del Cabo. The majority of non-Mexican inhabitants in the community originate from the United States, and along with residents from San José del Cabo they account for the 80% of the U.S. population in the state. ^ "Los Cabos". Enciclopedia de los Municipios y Delegaciones de México. Mexico: INAFED. 2010. Retrieved July 23, 2014. ^ John Howells and Don Merwin (2007). Choose Mexico for retirement. Guilford, CT: The Globe Pequot Press. p. 182. ISBN 9780762743926. ^ a b c d e f g "Poblacion Por Municipio, Superficie, Densidad De Poblacion" (PDF). Retrieved 2018-04-30. ^ "Best Destinations in Mexico - Travelers' Choice Awards - TripAdvisor". ^ "An Interview with Harumi Fujita on the Archaeology of Baja California Sur". ^ "Thomas Ritchie (1810 - 1874) - Find A Grave Memorial". ^ Inc., DAGTech Solutions,. "Home Page - Bisbees.com". www.bisbees.com. Retrieved 2017-08-07. ^ "Error". www.conservation.org. Archived from the original on 2011-09-28. Retrieved 2011-01-08. ^ "The Center for Environmental Law in La Paz". ^ "Going Green in Los Cabos". ^ "Is Los Cabos Becoming a Luxury Leader in the Americas?". TravelPulse. ^ Vacations, Cabo San Lucas. "Getting around in Cabo San Lucas & Los Cabos". www.cabosanlucas.net. ^ "Mexican Newspapers and News Sites". ^ "Cabo San Lucas, Baja California Sur Köppen Climate Classification (Weatherbase)". Weatherbase. Retrieved 2019-02-21. ^ "Hurricane Odile Timeline: Unprecedented Cyclone Leaves Widespread Damage in Cabo San Lucas, Baja California". weather.com. Retrieved 2014-09-17. ^ Ltd, Copyright Global Sea Temperatures - A-Connect. "Cabo San Lucas Sea Temperature January Average, Mexico - Sea Temperatures". ^ "Estado de Baja California Sur-Estacion: Cabo San Lucas". Normales Climatologicas 1951–2010 (in Spanish). Servicio Meteorologico Nacional. Archived from the original on March 3, 2016. Retrieved 22 April 2015. ^ "Extreme Temperatures and Precipitation for Cabo San Lucas 1937–2010" (in Spanish). Servicio Meteorológico Nacional. Archived from the original on March 4, 2016. Retrieved 22 April 2015. ^ Morales, Omar Lizárraga (1 January 2010). "The US citizens Retirement Migration to Los Cabos, Mexico. Profile and social effects". 1 (1) – via journal.lib.uoguelph.ca. 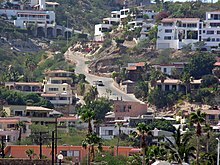 Wikimedia Commons has media related to Cabo San Lucas. Wikivoyage has a travel guide for Cabo San Lucas.